Today I’ll share an activity to help you understand bulerías more deeply. I also want to show with you a different version of this letra and a video of Tía Juana dancing to it at the Peña la Bulería caseta during the Feria de Jerez. (Spring is here and feria season is on the way.) I’ll highlight key points in the video to assist you in making sense of bulerías. First, the letra. I’ve heard many variations of this letra, most often as soleá por bulerías (see the second video of Miguel Lavi) but also por bulerías and even por tangos . . .
“Antonio” never stops singing for her. Your singer will not abandon you in bulerías. Notice how she enters with the cante and leaves with the cante. She is dancing on a floor tile, figuratively, that is. This bulerías is small and short, fiesta-style! Put yourself in her place. How would you dance if you had that much (or rather that little) space? Where do you hear the jaleos happening? How often are they given? The palmas. There’s no guitar, just cante, jaleos, and palmas. Together the palmas create the compás. Listen to the different patterns people play and when they do what they do relative to the cante and baile. How do they affect the dynamics? I suggest watching at least one more time, paying attention to all of this and practicing your palmas and jaleos. Observation is one of the most valuable learning tools available, so . . .
Analyze what is happening between the dancer and the musicians, especially the cantaor. Identify the different elements of the structure. Then imagine how you might dance in that same situation. 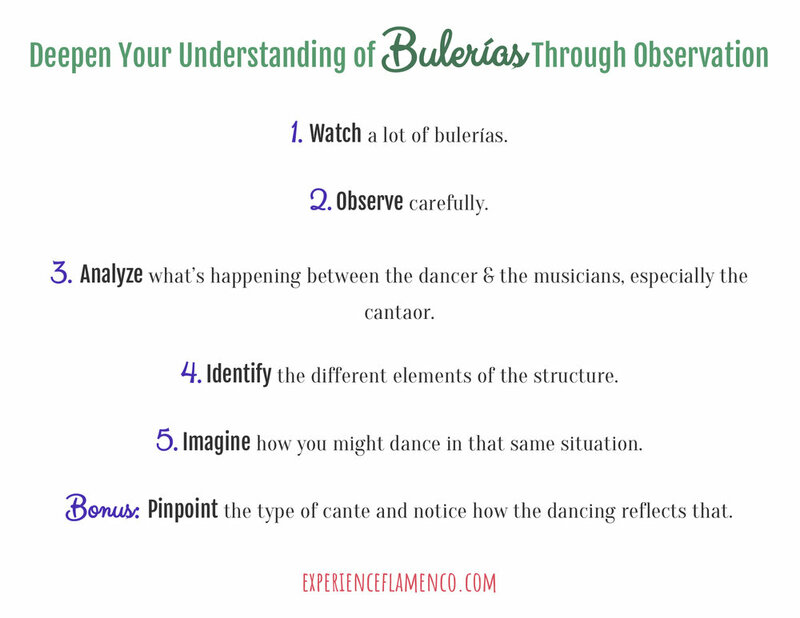 *Really, you could follow the above steps to deepen your understanding of any flamenco dance, not just bulerías. You can hear Camarón sing it here at 1:45 like this (más o menos). Check this out for more variations (and examples of) this letra. What things did you notice from the video of bulerías at the feria? What did you learn about bulerías? Could you identify the different parts of the structure? What did you discover by watching other bulerías videos? Which videos did you watch? Please share in the comments below.